Mobiles are changing the way enterprises innovate in business and keep one up on the competition. Not so long ago a website was considered indispensable. While a website has not diminished in importance, it is mobile apps that are in focus as a business driver. According to statista.com the number of mobile users is expected to cross the five billion figure by 2019, doubling the existing user base. 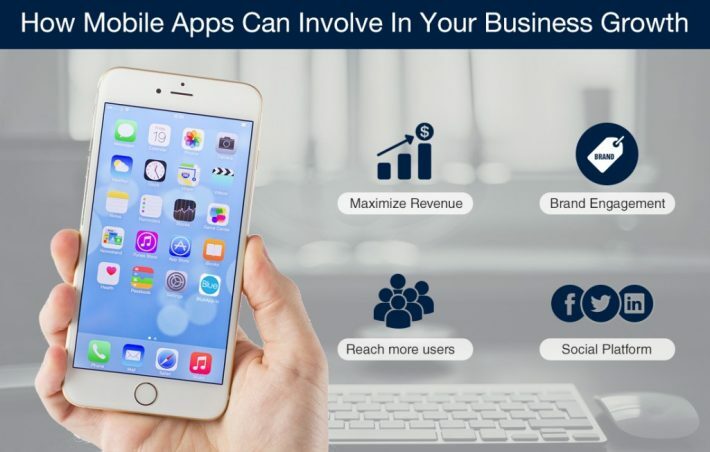 Mobile apps are not an option; they are mandatory for business growth. The first step is to engage the right mobile app developer to realize this vision of growth and derive mobile app development benefits in business. Let’s face it. A company’s internal operations are crucial to productivity and efficiency. It is the norm rather than the exceptions for executives to be mobile. At such times they may be out of touch with office and company data. Collaborating with other executives is difficult. Their productivity is affected just because they are out of office and cannot access data. A mobile app that helps employees stay connected with each other and access as well as carry out processes when they are out of office greatly improves operations. It also reduces stress and simplifies workflows. For some enterprises, especially those with branches in varied locations, this type of app may be of prime importance. Naturally, the progression leads to interactions with vendors and customers as well. The same processes that are done through a web app are possible through a web app designed by an app development company. Enterprises can keep in touch with vendors, find out status, engage in conference chats, let executives manage sales and inventory all through the mobile platform in a secure way. An app can be purposed to suit specific operations which is the way to go instead of a portmanteau app that includes HR, inventory, sales and customer support. Different apps means each category can load the app they need and it works fast with just a few taps to get things done. Whether it is a vendor, a sales agent or a client, the mobile app obviates the need for them to launch a website and navigate to the website of the company to take matters further. This immeasurably speeds up operations and promotes efficiency leading to satisfaction, especially for customers. Customers are busy and impatient. They need lightning fast responses to queries or resolution of issues. What batter than an app purposed for customer engagement. An app that resides on their device helps them get in touch fast and get immediate responses leading to satisfaction, loyalty and, possibly, more purchases. Data drives business and if an enterprise wishes to capture specific data, getting it through apps is easy. A mobile device has a variety of sensors including GPS. All these help a company capture essential data such as duration of time the customer used the app, his precise location and preferences. An app can do much more than cookies on a web browser in capturing essential data that helps companies derive insights. An app gets you captive audiences. You can push notifications. You can encourage users to use the app with lures such as discounts and cashbacks. You can get an immediate response by encouraging them to call from right within the app. A video call is possible since mobiles have a camera. You can keep sending feeds about product offers. You give them value and make them feel wanted. Ultimately these translate to loyalty and more revenues. It may have even overtaken you. If your competitor has an app and your customers migrate to those apps then you are the loser. Get an app development company to come up with engaging and useful apps that your users will love to keep in their phones and use on a regular basis. The app could well be the magic potion that gives wings to your business feet. Why Is Ionic Framework Considered Great For Progressive Web Apps?